Description: Raccoons are four legged, nocturnal, tailed mammals native to North America. Their sizes can range from 15-25+ inches and they can weigh anywhere from 7 to 20 pounds. Raccoons have a grayish colored fur with a long (8"-15" inches) tail and specific tail/face markings which are usually black or dark brown in color. Raccoons are equipped with an "undercoat" of fur. This coat protects the animal in cold weather. Raccoons are known for their superb intelligence, climbing abilities, as well as their extremely dexterous paws. They are like humans in that they have opposable thumbs, allowing them to easily open and access a number of areas that many other forms of wildlife would find impossible. Once considered solitary animals, recent studies show that raccoons do indeed participate in gender specific activities. Females seems to gather together in a central area while males (usually in groups of no more than 4) will join together to protect their territories (ranging up to 7 acres) against invading males during the mating season. Food Sources: Raccoons are known to be omnivorous - meaning they will make use of just about any food source available. These animals are scavengers, moving from area to area following available food sources. Open trash cans or dumpsters, animal feed, other small mammals and amphibians, as well as gardens and fruit trees are just a few food sources raccoons typically make use of. Keeping accessible food sources under lock and key is imperative to keeping raccoons from invading/surviving on your property. Life Span & Reproduction: Raccoons have a pretty decisive breeding season. Spring time (March through May) is core breeding season for these animals. Gestation period is fairly long - averaging out to about 65 or so days before birth. Typically, raccoon mothers have one litter a year, which averages approximately 3 to 5 kits (raccoon young) per litter. Raccoon mothers stay with their kits an average of 8 weeks after they are born. The average life expectancy for a raccoon in the wild can range anywhere from 1 to 3+ years. Vehicular accidents and hunting contribute to their short life span. Typical Areas of Entry: Raccoons typically search for a large, easily accessible opening to gain easy access in to roofs/attics and basements/crawlspaces. They are skilled climbers and their strength allows them to pry open just about any open entry point or door to accommodate their size for entry. Trees and limbs should be cut back given that they can facilitate climbing/entry even easier for the already skilled raccoon. Soffit vents, gable vents, and roof vents should be properly screened as these are typical access points for raccoons. Raccoons are famous for uncapped chimney entry, as well. Starting a fire won't help. You will simply allow the damper to become open, allowing the raccoon easy access inside and in to the living space. Raccoons will be urinating and defecating in the areas they habituate. This is extremely unforgivable. The raccoons can literally destroy this space in a matter of days. Insulation, existing in the attic or crawlspace, will become soiled and an odor is likely to be profound due to the excrement and debris left behind. The "R" value, which dictates thermal resistance, will become extremely declined as raccoons are heavier animals. Their weight alone, even without debris left behind, can destroy and make insulation useless. Trappro offers attic insulation/debris removal and re-insulation services. Typical Treatment: First, a thorough inspection of the structures exterior and roofline by a Trappro technician will be completed. Any area(s) of entry will be identified and the option will be presented to begin trapping and removal services. Trapping services last for approximately 3 to 5 business days and work as our first line of defense. Live cage traps will be set near or on the entry/access points. The open areas where the raccoon(s) have gained entry will be monitored for activity during the duration of the trapping service. The technician will be placing a breakable barrier of some sort over/inside the holes or entry points to monitor the raccoon(s) movements in and out of the open areas. This technique allows us to record wildlife activity and will assist in dictating the duration of the trapping service needed. Once a point of no activity has been reached, Trappro will feel comfortable removing the live traps and installing temporary screenings over the existing entry points. The trapping/removal service, along with our patch, is guaranteed against animal re-entry for a period of 30 days. Trappro recommends permanently sealing the raccoon(s) area(s) of entry. Upon the inspection, a proposal will be provided for permanent repairs to the home or structure. Trappro completes and warranties permanent repairs against wildlife re-entry for up to 10 years. If raccoons are simply inhabiting or invading the yard with no specific point of entry, Trappro offers an open area trapping service for these purposes. Open area trapping is difficult simply because Trappro cannot force animals in to a trap; they must lead themselves inside before we are able to remove them from any property. Open area trapping services last for a total of 7 business days (NO weekends or national holidays) and hold no guarantee. Any animals/wildlife lead inside our traps will be removed. Trappro does not charge per animal or per trap. Dangers: The number one concern when dealing with a raccoon intrusion is the rate of transmitted rabies disease to these creatures. Rabies is the most highly transmitted disease with this type of wildlife. It can be easily transferred to humans and other animals with direct fluid contact (bite, scratch, etc.) NEVER approach a raccoon that is discolored, looks/acts sick or confused, hunched over, or appears to be lacking nutrients. Distemper is the second most fatal element to the raccoon population; humans are the first. Distemper starts out as runny nose, congestion, and conjunctivitis which then slowly develops in to pneumonia. Once brain damage sets in, the raccoon may wander aimlessly or in circles, and become malnourished, resulting in death. There is NO treatment for distemper and raccoons caught with said disease are euthanized. Cats/dogs should be vaccinated and kept away from these creatures. Raccoon excrement/droppings can also contain dangers such as roundworms, tapeworms, and various other parasites which are easily transferred to humans or pets. 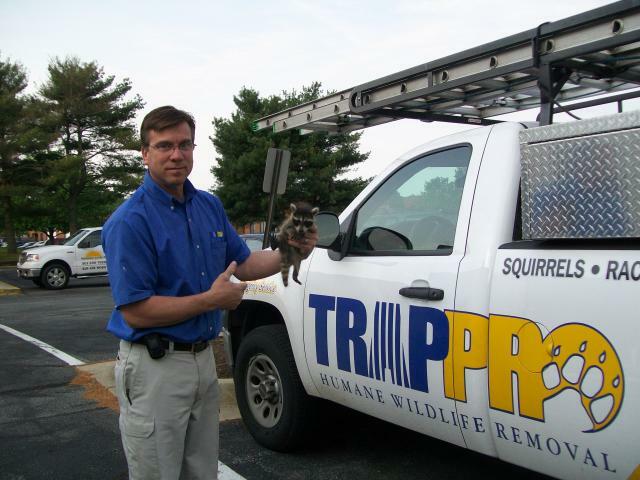 Trappro humanely removes raccoons that have gained access to your attic, walls, roofs, chimneys, shed or other areas of your home. Raccoons will be trapped and removed. Raccoon nests, droppings and other messes made by raccoons will be safely removed from walls, attics, sheds etc. Dead raccoons or baby raccoons will also be carefully removed if found in your home in Maryland, Washington DC or Northern Virginia. During Raccoon Breeding Season: Raccoons love to enter attics and sheds, chewing holes and causing damage to many areas of the roofline *We safely remove Raccoons, clean up the mess & can provide repairs to prevent animals from reentering. Our professional trappers will also be able to seal up holes in attic or walls including fireplaces and vents where raccoons have entered the home. Trapping and exclusion of raccoons is available for homeowners and business owners throughout Maryland, Washington DC and Northern Virginia. Call Trappro TODAY! Have your raccoon intrusion on the road to resolution!